A comprehensive study guide for advanced middle school students that will prepare them for high school and familiarize them with the new Common Core standards. With content developed by a team of teachers and curriculum specialists and reviewed by assessment experts with a minimum of five years of classroom teaching experience, SOLARO mathematics study guides are wholly curriculum aligned and serve as an excellent source of material for review and practice. 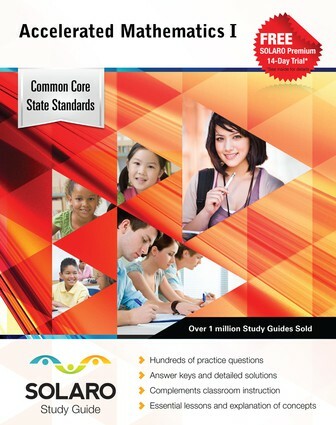 Each guide breaks down the Common Core State Standards into teachable units, making it simple for educators and students to identify key learning concepts and how they align with the accompanying exercises and assessments. The practice questions and sample tests have detailed solutions that show problem-solving methods, highlight concepts that are likely to be tested, and point out potential sources of errors. The multiplatform SOLARO study solution also features additional learning tools in the accompanying online version, allows educators to manage all of their classes with an intuitive interface through mobile apps or any web browser, and offers parents a free and easy-to-use online account, thus ensuring that children, educators, and parents alike are engaged in helping students achieve success. Intended for seventh and eighth graders who are aiming to have completed Mathematics I by the end of eighth grade, this advanced study guide includes sections such as Quantitative Reasoning, Describing Relationships with Equations, Rational Exponents, Functions, Single Variable Data, Linear Models, Polynomials, and Pythagorean Theorem. 632 Pages. Softbound.